Since my childhood I was surrounded by music, fine art and dancing, it was part of my life that ultimately lead me in my creative direction to become a professional photographer. Portraits of artist requires photographers to go outside of standard photography rules, and push our limits of creativity to capture strong, raw images of artists that tell their story and vision about their art. 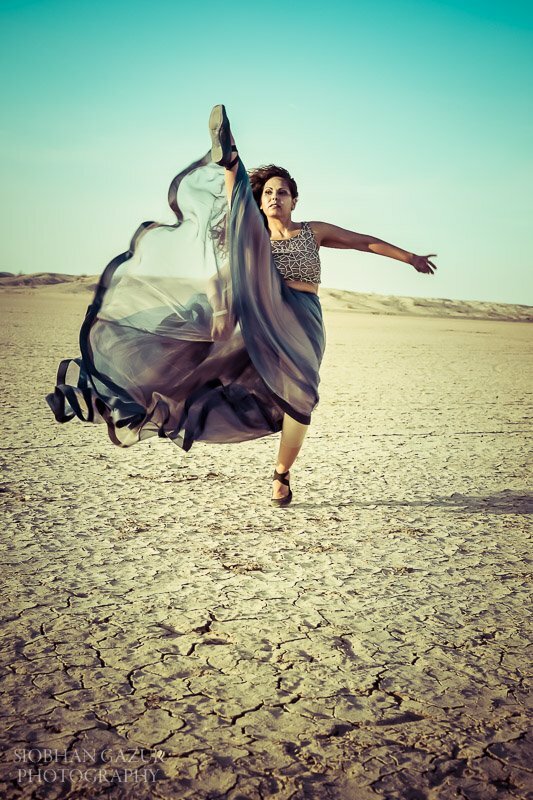 Meet Eman Attallah - her heart is wild and her soul is free. She is a poet, pianist, dancer and meditator- a beautiful woman on the journey who inspires others with her deep soul and big heart. Eman's Instagram and Facebook. Download and review "Symphony" by Eman Attallah from iTunes. I wanted her inspiration, passion, vision and spirituality to live in her photographs. I was curious what ignited her to follow her artistic path, her experience and vision for the portrait session. I used to listen to records with my mom as a toddler. By the age of 6 my parents bought an upright piano. The day that instrument came in the house I just knew that the piano was my instrument. Beethoven. Fur Elise was the first song I learned how to play on the piano at 6 years old. My older cousin taught me this song, and from that I learned how to play by ear. Siddhartha, and his journey of becoming Buddha. I love how he questioned life and took extreme measures to find the truth. Then realized that the middle path of moderation is the ideal way to wisdom. Frida Kahlo. A very intense creative woman who lived with chronic pain, yet she continued to create and to live her life. Silence and meditation retreats. The most beautiful creations come from a space of silence. Sometimes it manifests itself into a dream, and when I wake up I simply write the story that I witnessed. What are important components for you when writing your music? The feeling has to be sincere. It’s important for me to convey the emotion as strongly as I feel it when I’m creating. Also the subject matter and lyrics are a huge part of my creativity. Songs are written in the form of poetry because each person relates to the poem in their own way. I’ve always been fond of poems, its such a romantic expression. What is the meaning behind this song? 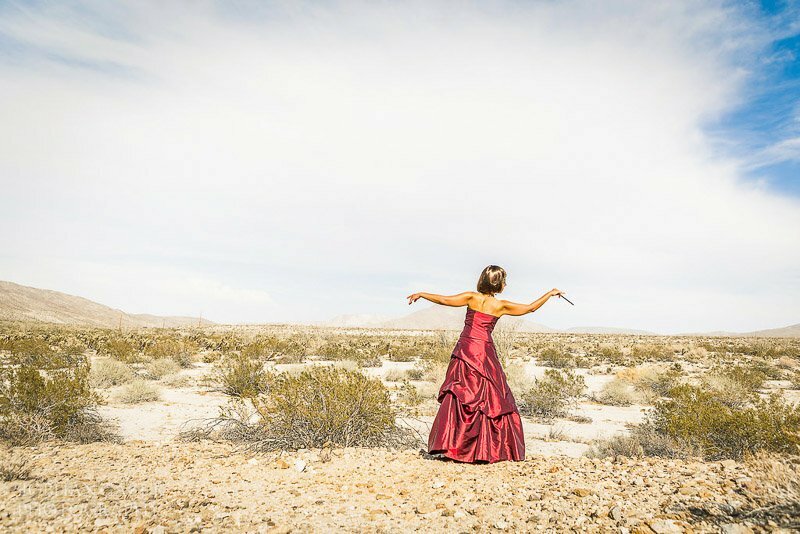 "Symphony" is Inspired by a re-occurring dream I’ve had of walking alone in the bare desert. Always thirsty with nothing in front or behind except endless sands. After many years the dream was different. There was a black piano in the far distance being played a bearded man wearing a black hat. His name is Justin Froese and he’s the producer of the song. The most vivid and poetic dream I’ve ever had. 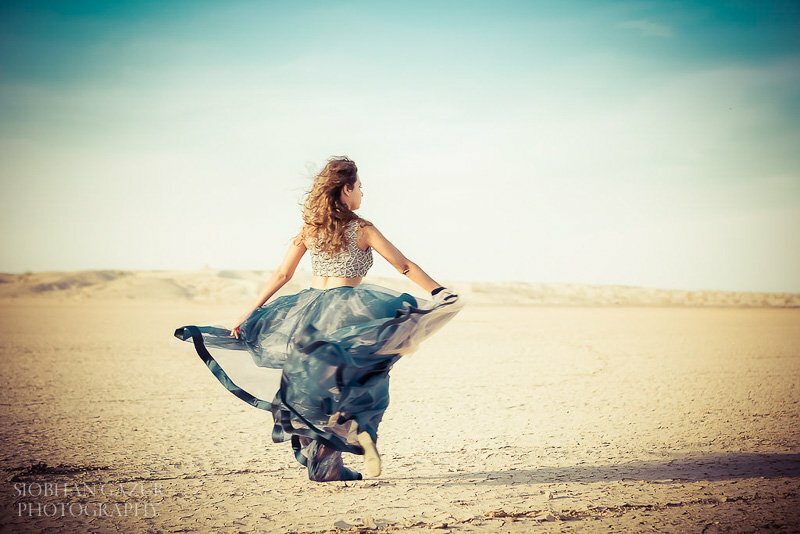 As he played the piano in the middle of the desert I felt the music calling me. The piano made no sound in the dream, but it made the wind blow and whistle. Each step I took closer to the silent music my thirst was slowly being quenched. When I reached the piano Justin stopped playing; the wind stopped blowing and the silence entered the dream. At this instance I have become fully quenched. Inside of a dream I felt completely real. I Sat next to him on the bench and played along. I placed my ears on the piano keys as if to hear it’s heart beating. This song speaks about the joy of taking a solitary journey in life. Of finding music in the heart of an empty land, of finding self through silence, and celebrating all of it’s wonders. What is the process for you when writing a song? It’s never planned, I just zone out and it kind of happens on its own. Usually takes a day to complete. When I’m done I take a deep breath in and am ready for a nap right after. I’m an intuitive person, so I go by feeling, I can always feel a song coming right before I write it. How does it make you feel to hear yourself when you released your song? So proud. I get tears in my eyes because It’s something I’ve been putting off for a while. Also hearing my own voice for the first time in a recording is like having an out of body experience. Like I’m in disbelief that I am hearing my own voice. I love it! Why was moving to India so important to your personal and spiritual growth? I wanted to go to India to reestablish my sun gazing practice. I was told by a spiritual leader and humanitarian Sri Sri Ravi Shankar that I was a sun gazer. I was informed this after many years of health issues and not being able to consume solid foods. I was also living with chronic pain issues, and did not have the maturity to stay centered through this challenge. I needed a drastic change in my life, and a new commitment to my self. In order to grow through this discomfort I needed to spend some time on myself. Meditating at home once a day was not enough anymore, My spirit was calling me to do something more, and the calling was so strong, that I had no choice but to listen. So I planned a trip to India! What steps did you have to take to make this happen? I had to leave my husband of 15 years to get here. We both love each other very much and support one another now more than ever. Me leaving was a decision we both agreed on. Sometime to prosper in life it takes going in different directions. I also emptied my retirement account, donated most of my clothes and things so that I could travel light. I had to start life all over again, starting by getting rid of most of my old things. Hardest part was saying good bye to my Neopolitan Mastiff, whom I raised since he was a little puppy. I was happy to know he didn’t really miss me, as long as he got fed chicken he’s fine! How has this journey impacted new music for you? Connecting with people and seeing the smiles really touches my heart. Every beautiful face I see tells a story, and in that story a song comes forth. How does the silent meditation help you in this process? Just like a painter starts a creation on a blank canvas, Music comes into play from a quiet space. The silence eliminates all distractions and allows the purity of the emotion to be expressed fully. I’ve learned that nothing can shake a persons faith. Loving yourself is the greatest gift you can give to the universe, especially during tough times, that is when love is needed most. It’s important for me to create because that is how I express myself, and how I interpret love. What other talents do you have? What musical instruments do you play? How did you find belly dancing and sword fighting? Growing up in Saudi Arabia I’ve always been fond of belly dancing, and every Arab Woman has it in her to belly dance. The sword kind of found me. I’ve had my sword for 10 years and was planning on using it for a prop for one of my dances. Something magical happened as I held it and danced with it. So I took some sword fighting classes and continued to dance with it. I see that you are inspired by quotes. What are some of your favorite quotes? which quotes meant the most for our photoshoot and why? Gosh I have so many. . . .I love Rumi. The look with the sword was our last one, with the most intense make up, and at the most beautiful time of day. 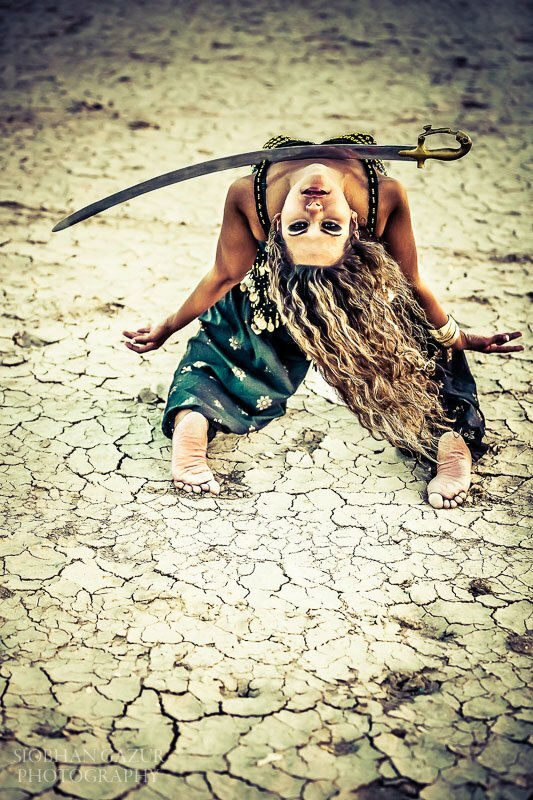 I felt so free dancing with my sword in the hot desert sand, bare foot. I loved how you got me to connect with the sun in this one, you made it seem like I was holding it in my hand. Also all the back bends in the heat with the sword on my chest felt like true surrender. It really translates in the pictures, as a spirit dancing! What is the biggest belief that you live by? To completely honor the spirit. To work though this life to reach freedom. What is this experience in India teaching you? Independence. living fearlessly. Embracing adventures. Connection. I’ve been connecting with wonderful people. I’ve also done some volunteer work in nearby villages. I’ve learned that giving is something I want to incorporate more in my life. Becoming more centered, more focused. How was the experience you had with doing a photoshoot with me? It was the most fun I’ve had in a long time! Driving out to the desert with you, Palo, Vendela and Maya was so amazing! Working with you was so creative, I felt like you really helped bring the characters out fully, and the results are better then I imagined! The Arab American celebrating her freedom was one that came out so much better with your direction. 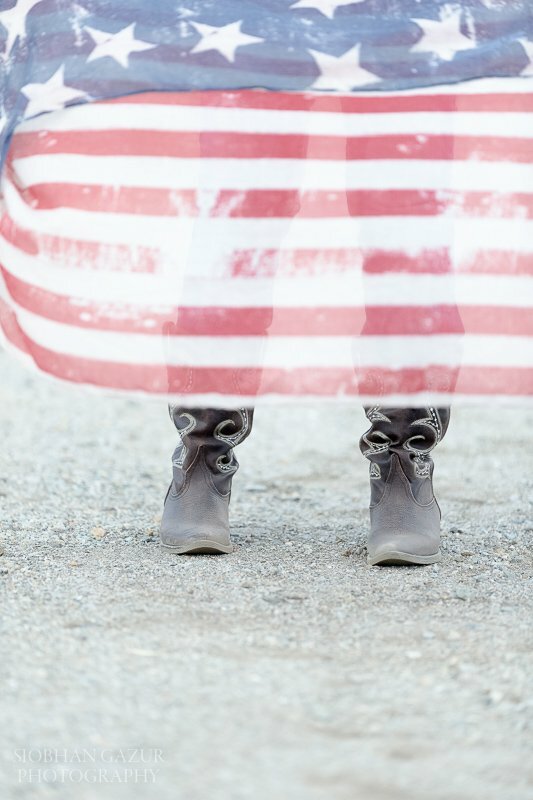 Using the American shawl in the wind to exaggerate that free flowing feeling was genius. 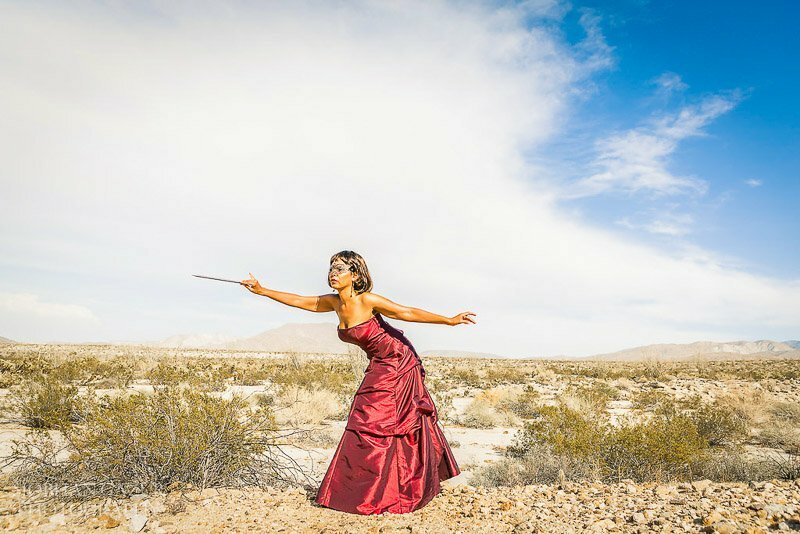 Second look with the conductor in the desert was really powerful. It’s the look that represents my song and you captured it so well. The most fun I had was doing the last look with the sword during sunset. I loved the ideas you brought forth, your professionalism and creativity. What did each theme/character mean for you. Who are these charters and how do they interact with your voice and music? First theme and character is Arab American, also the name of the album. The idea is inspired by my songs I’ve written that are both in English and Arabic. This character has her hair covered like a traditional Arabian, but is wearing a bikini top like an American. It’s a controversial picture, and that why I love it! She’s an Arab American;-) It’s unique to me because I lived an Arab American lifestyle. 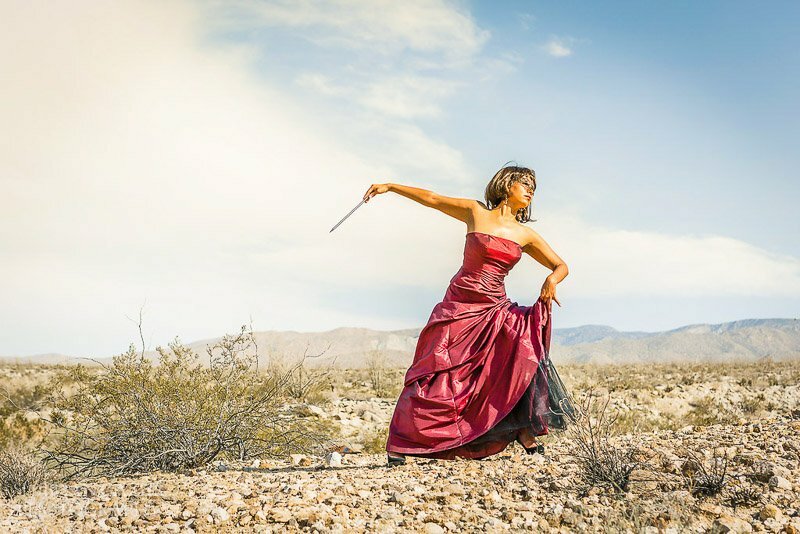 Second theme is a conductor out in the desert. This was inspired by the dream I had walking the desert sands. Which also inspired the whole photoshoot. 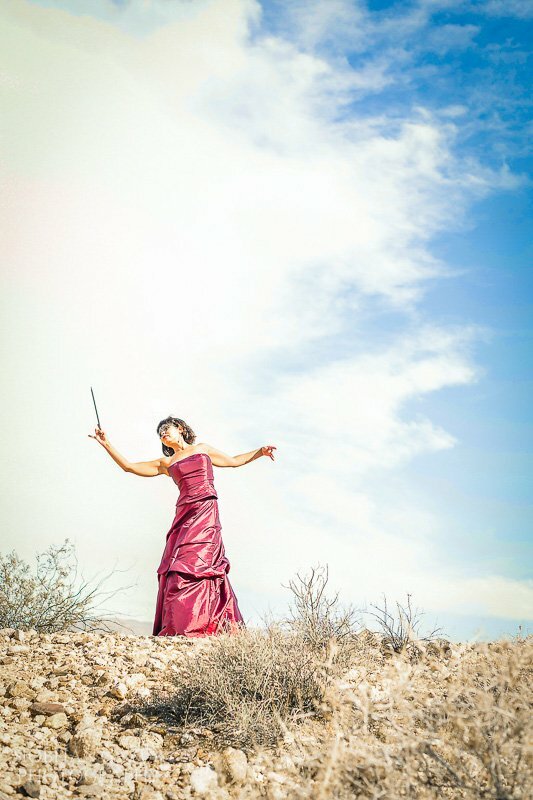 The musical being (This conductor) found a secret in the desert and conducted a symphony out of nothing. She’s able to hear different instruments and sounds that are coming from the depths of the earth and deep from within herself. It’s about spending time with the self. The spirit. Listening to the “Void” is listening to the self. I love the mystery of connecting with just the music, this song does that for me. Third look also speaks to the song Symphony as well. She plays the flute, and she dances. 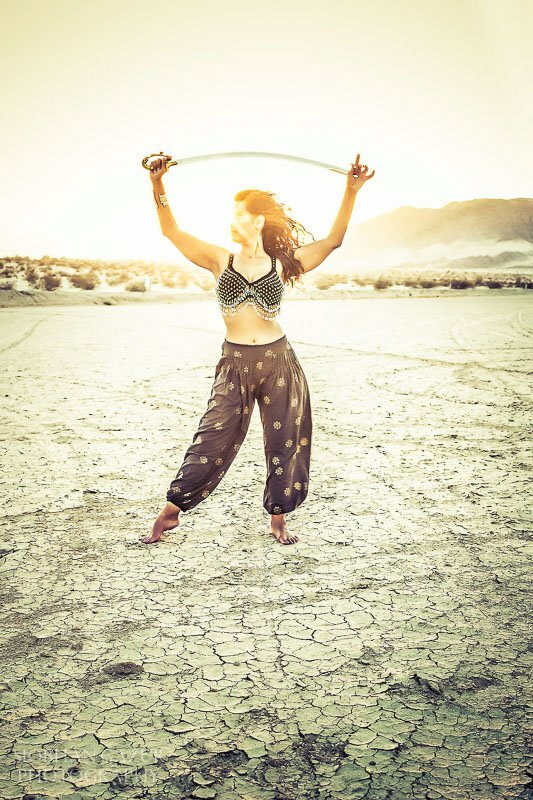 “oracle dancing.” Dancing freely in the desert was like dancing in the story of my song. That journey of self inquiry is joyful, beautiful, and liberating! Fourth look and theme: Sword belly dancer. This is me loving the sword. Enjoying the fight, of life, freedom and wisdom. And seeing that it’s all a dance! How do the photos and your music work together? It’s nice to have a visual for the creative ideas I have with music. Like the desert conductor makes for a stunning photo. How did you decide on props and themes? It depends what each character needs. I definitely needed a conductors wand for the desert conductor, and a mask was fitting because it exaggerated the mystery of the character. What did this shoot and the experience of that day mean for you? It meant that it’s the beginning of something real, and it’s time to pursue my music. The experience was joyful! I’m getting inspired to do a music video! What empowers you as a woman, poet, song writer, explorer and musician. What is most valuable to your heart? 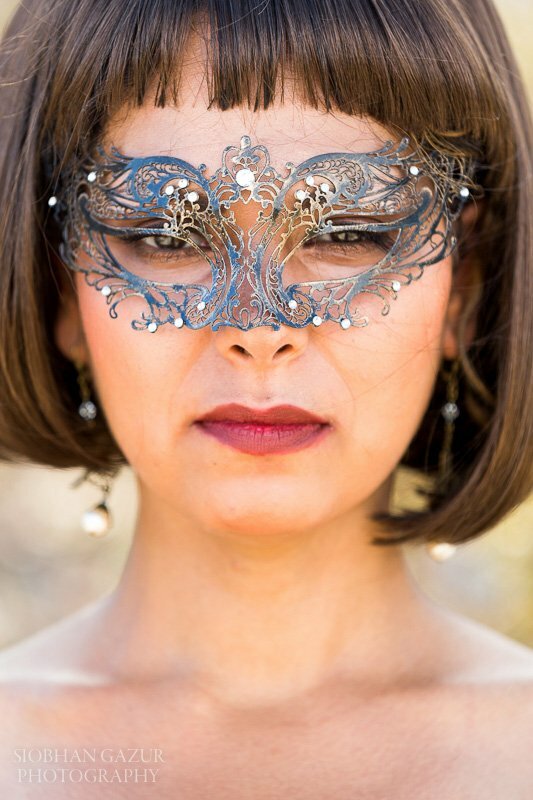 Maya Nozaki was our makeup artist and she worked her magic to enhance the photography effects we wanted to achieve. Eman's infectious love for music, people and love for life left a huge impact on me.